Inmaculada Garcia is a wedding dress designer from Barcelona, Spain and is one of the most sought-after bridal wear designers worldwide. Inmaculada is one of those unique women that are hard to come by as you just don’t expect such a successful designer to be so down-to-earth, heartwarming and accessible. I had the immense pleasure of interviewing her and after getting to know her better I have fallen even more in love with her brand! Inmaculada is passionate about her work and it shows in everything that she does. Her job is vocational – a calling, if you will. She started designing at the very tender age of 13 and was one of the youngest students in fashion design school. There, she had the opportunity to create her very first fashion collection (which was a hit among her friends, by the way!) It consisted of a vest collection and she sold it all. She finished her studies at 18 years old, but feeling that she still had a lot to learn, she complemented her fashion design degree with other courses. 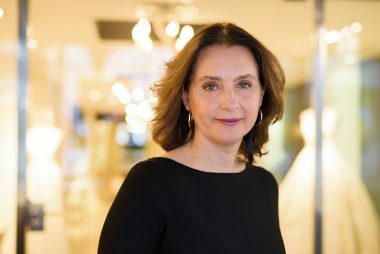 At 21 years old she “took the plunge” and bravely opened up her very first prêt-a-porter shop in the charming Sants neighborhood in Barcelona. Little by little, she gained very loyal Clientele and started getting requests from her Clients to design and make their wedding dresses from scratch. At that time, back in 1993, the Bridal wear industry was much more limited in comparison to all of the infinite possibilities that are out there today. 23 years ago, not only was it limited in terms of the brands that were specialized in wedding dresses, but also in terms of the styles of the dresses themselves. So, without making a conscious effort to pursue this line of work, Inmaculada found herself designing wedding dresses. And who was her first Bride? Her sister! When her sister got engaged she started searching for her perfect dress, and just couldn’t find it anywhere. She wanted something different and wasn’t keen on dresses with traditional cuts, big ballgown skirts and not much personality, which was what the Bridal wear brands were offering at that moment in time. Inmaculada designs for women who are strong , who want to make a statement , who know what they want and don’t want to sacrifice being themselves just because they’re getting married. Inmaculada’s Brides want to be true to themselves even on their wedding day and don’t want to feel like they’re “in costume” but rather that they are an elegant, romantic and beautifully heightened version of themselves. And Inmaculada’s sister got just the dress that she was looking for. Twenty years later, Inmaculada and her sister still talk about the wedding dress and surprisingly enough, acknowledge that the dress is very much in keeping with what Inmaculada’s brand has become: romantic and elegant. If a Bride today wore Inmaculada’s very first wedding dress, she wouldn’t feel outdated at all but completely at ease with today’s styles and trends. 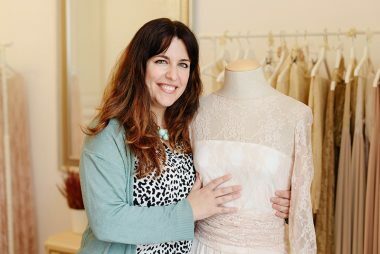 As Inmaculada now admits, her tender age at the start of her career gave her the drive, insight and enthusiasm, as well as the innocence and naïvete to take a risk and create her first Bridal dress collection. Perhaps if she had been older, she wouldn’t have taken such a risk – as she knows from experience, “the older you are, the more you think things through, weigh the pros and cons, seek out financial stability…” and the Bridal wear industry in Spain would have been deprived of an extremely talented, strong and passionate designer. And our loss would have been psychological science’s gain because Inmaculada’s other passion is psychology. The inner workings of the mind, how people behave, why they react the way they do and psychology as a whole is one of her lesser-known passions. In my humble opinion, her two passions work very well together as she can help manage Bride’s emotions. I wouldn’t be surprised if one of the reasons that Brides have complete faith in her is that she understands them so well, she deciphers their emotions, their underlying concerns and can adapt and relate to them on another level. “DESIGN is for everyone” is another one of the reasons why Brides adore Inmaculada. She firmly believes that quality design doesn’t mean that you have to “break the bank”. You don’t have to sacrifice quality design to suit a limited budget. Her quality, creativity and unique designs can be made available to everyone’s budgets through the use of different types of fabrics, textures, beading, etc… She still recalls how one of her Brides started crying in the dressing room after trying on her wedding dress. When Inmaculada asked what was wrong, the Bride said “these are tears of joy. I’m crying because I can afford my dream dress”. And although wedding trends are constantly changing, finding the dream dress is still at the top of every Bride’s to-do list. Nowadays only 25% of weddings are religious (in comparison to 80% of weddings being religious 20 years ago) and a Bride’s average age is 30 (in comparison to being 20 years old back in 1993), but let’s be honest – a Bride’s priorities haven’t changed. After her fiancé pops the question and slips the ring on her finger, the very first thing that she thinks of is THE DRESS. The main difference is that at the age of 30, Brides seek out Bridal gown designers that not only provide quality fabrics and styles, but that can also adapt to their vision. And this is what has truly revolutionized the Bridal wear industry here in Barcelona – the fact that a designer such as Inmaculada can customize the dress to each Bride’s vision so that no two dresses are alike. Each dress is designed, sown and lovingly crafted in her atelier in Barcelona. As Inmaculada states “every single one of our wedding dresses have a first and a last name; they are not just a number”. What advice does Inmaculada have for all Brides out there searching for their dream dress? So be sure to do your homework, narrow down your preferred brands to 2 or 3 at the most and always stay true to your style. Don’t let yourself be influenced by mothers, sisters, future mothers-in-law, bridesmaids or even internet! You know yourself best and you know how you want to feel on your wedding day. In Inmaculada’s words “Stay true to yourself, to your essence and your vision, and rest assured that you will find the wedding dress that you’re dreaming of”. Enjoy dreaming about your wedding dress! 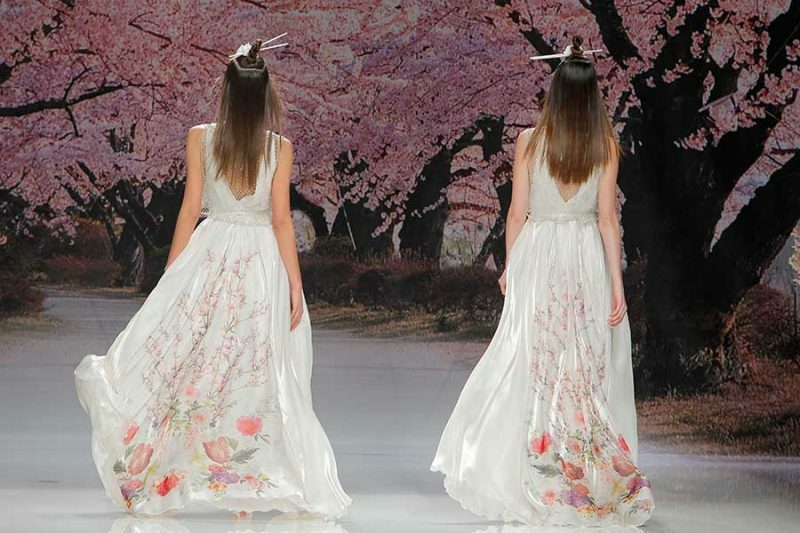 Want to check out Inmaculada’s wedding dress collection for yourself? She has international presence in over 17 countries, at points of sale in cities such as New York, Los Angeles, Chicago, Philadelphia, Dubai, London, Osaka, Beirut, Moscow and Viena, among others. Feel free to check out her website here to see the complete Bridal collection…and for more information about which stores near you carry her brand, click here. Your wedding gown is a purchase you will remember for the rest of your life, slipping into THAT dress and knowing it is the one for you is a moment you will never forget.